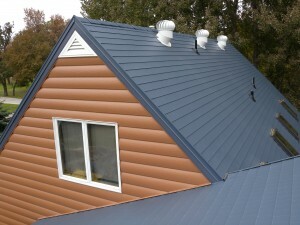 If you are searching for roofing contractors in the Madison, Wisconsin, area, it’s important to first understand what type of material you want for your home. There are many options to choose from, so you may find it difficult to discern which one will give you the look you want while shielding the infrastructure of your home. However, many roofing contractors will attest that if you want something that is strong, attractive, and will last a lifetime, then steel is the way to go. At ABC Seamless Home Specialists, our roofing contractors can provide you with a strong, beautiful, and durable steel roof that will last a lifetime. We are a family-owned company that takes pride in offering premium, American made products and installing them with expert precision. Our roofing contractors are all factory-trained and work full-time – never subcontracted – so you can feel confident we will get the job done right the first time. To learn more about why our roofing contractors, and why steel is the best roofing material for your Madison, WI, area home, contact the professionals at ABC Seamless Home Specialists today.